‘Tis true, my friends! But you don’t have to take my word for it. Research shows that having a positive mindset comes with a host of health benefits including a reduced risk of death from cardiovascular disease, greater resistance to the common cold, lower rates of depression, better coping skills during times of distress and increased lifespan. And if all of those benefits weren’t compelling enough, perhaps the best reason to cultivate a positive mindset is the increased levels of happiness that come with it. Life is too short to be unnecessarily miserable, amirite? However, the world we live in today makes it pretty dang easy. When I say “negativity”, I’m not just referring to someone who is constantly in a bad mood, complaining, bringing everybody down, and/or wallowing in self pity. A negative mindset, for the sake of this post, refers to being hyperfocused on scarcity, or to put it another way – being in a constant state of “not enough”. Not rich enough. Not talented enough. Not pretty enough. Not fit enough. The list goes on. And I think we’ve all felt that way at one time or another. That you have a brain whose sole purpose is to keep you safe and is therefore wired to constantly be on the lookout for threats. That advertisers and marketers are bombarding you 24/7 (the average American sees up to 5,000 ads per day) with information on why you and your life are insufficient and what they can sell you to fix it. It’s no wonder that most of us are stuck in a place of feeling constantly inadequate and like we need to own and be MORE. What is a positive mindset reallly? Now, let’s get one thing straight. Having a positive mindset isn’t about denying reality and acting like everything is all rainbows and unicorns when it isn’t. Working to continually grow and improve, not because you hate yourself and think you aren’t good enough, but because you love yourself and know that you deserve to fully realize your potential. Appreciating both the good and the bad times in your life, and embracing every challenge as an opportunity for growth and learning. Always expecting to get positive results but being able to accept and still move forward when things don’t go your way. Making an effort to see the best in other people and in every situation. So, now that we’ve got that cleared up, let’s get into the tips! It’s much harder to develop a positive mindset in a negative environment, so I recommend beginning by doing everything you can to change your surroundings to support positivity. What you see day after day is what you begin to internalize, so fill your space with words that uplift you. This could be quotes that you find particularly inspiring, a personal mantra, or writing your top goal as an affirmative statement (I will “your goal” by “deadline” because “your why”). Also, consider decluttering and cleaning up your living space. Research shows that living in a messy, disorganized environment is correlated with a lower level of well-being, unhealthier eating, and less efficient thinking. The state of your mind and the state of your body are intricately connected. You don’t have to go overboard or get it “right” 100% of the time to reap the benefits of a healthy lifestyle. Do your best to make time for exercise, eat nutritious meals, and get adequate amounts of sleep. Not only will you physically feel better and more energized, but these habits will also positively impact your mood and decision-making ability. Just like a diet comprised mostly of junk food will result in an unhealthy body, feeding your mind mostly “junk food” will result in an unhealthy, negative mind. Think about it – most of the headlines have to do with crimes, natural disasters, tragedies, and political fiascos – all of which is overwhelmingly negative. Turning on the morning news means immediately starting your day by inundating yourself with negativity – 99% of which you are powerless to do anything about. Talk about a downer. Suffering from FOMO? I feel you – that’s exactly how I felt when I first decided to cut out the news, but trust me when I say that if anything of great importance happens, you’ll hear about it from somebody. If you can’t fathom not being in-the-know, I recommend signing up for a daily email newsletter that gives you a summary of current events in bite-sized chunks like theSkimm or The Quartz Daily Brief. Various studies have linked social media use to lower levels of happiness and life satisfaction as well as greater feelings of isolation, envy, unattractiveness, and inadequacy. This is not to say that social media is ALL bad and that you should completely cut it out of your life, but rather to suggest that it’s worthwhile to think about why and how you use these platforms. It’s one thing to be inspired by another person’s life and success on social media, it’s quite another to feel jealous or like a failure in comparison. Unfollow or unfriend anyone who makes you feel bad about yourself or negative. On the contrary, try to fill your social media feeds with more people who inspire and motivate you. In the beginning of my mindset makeover, I used to play motivational videos every morning (from YouTube channels like Mind Innovation and Motivation Grid) which helped me start the day in the right frame of mind. These can be great for pumping you up and providing the “will” you need to get started. However, while videos like these are helpful for changing your internal dialogue, long-term growth requires greater substance. Seeking out content (books, videos, podcasts, etc.) where you can learn how people that you admire have created their lifestyles as well as how your mind, body, and happiness work is what will give you the “way”. The people who you spend time with have a tremendous impact on your mindset. Is there anyone who consistently leaves you drained, beaten down or in a negative mood? If so, re-evaluate their place in your life and consider ending the relationship. When that’s not possible or desired, try to minimize the amount of time that you spend around those individuals and steer clear of sensitive topics. A less obvious thing to look out for are relationships with people who you care about and enjoy, but whose behaviors don’t match the lifestyle and goals you’re trying to achieve. One of the first realizations I had when I decided that I was going to take control of my health and happiness, was that my friends at the time weren’t going to change with me, and that I shouldn’t expect them to. Even though I still cared about all of them, I ended up spending considerably less time hanging out with them, because the activity that brought us all together – partying the night away – wasn’t in alignment with my goals or having a positive impact on me. Take a moment to reflect on who you spend the most time around and devote the most energy to. Are the people you spend the most time with bringing you closer to or further away from who you ultimately want to be and what you ultimately want to do? Are there any people that come to mind who you need to stop giving energy to either by minimizing the amount of contact you have with them or by ending the relationship entirely? What qualities/characteristics would your ideal friend/romantic partner/coworker have? Do you currently embody those same characteristics? How can you surround yourself with more people who fit this description, whether it’s in real life or online? Practicing self-care is essential for reducing the negative effects of stress and maintaining a positive mind so don’t forget to make time for it daily, even if you can only spare 5 minutes. For a list of 51 self care ideas to kickstart your routine, check out this article by Wholefully. We often talk to ourselves in a way that we would never even DREAM of talking to someone else. The first step to ending the self-doubt, belittling, and judgment going down in your cranium is simply to notice it. When you recognize that you are being unkind to yourself, deliberately reframe the negative thoughts so that they are positive, supportive, and encouraging. A lot of misery and negativity stems from stressing about things outside of your control and that may never happen. When you find yourself worrying, focus your energy on determining what you DO have control over. You may not be able to prevent an undesirable event from happening or change what’s happened in the past, but you CAN change how you prepare and your reaction to events and circumstances. Take a few minutes each day to write down 3 things that you’re grateful for. Try to be as specific as possible. For example, instead of writing “my family” which will get repetitive fast, writing something like “the fact that my mom still texts me ‘I love you’ every night before bed” (true story, love ya mom 😘). A daily gratitude practice retrains your brain to be on the lookout for the positive in your life, especially those little things that we so often take for granted. When you start intentionally looking for the good in your life, you’ll begin to see it everywhere. Consistent meditation can literally alter the structure of your brain, including the brain cell volume in the amygdala which is responsible for fear, anxiety, and stress. Consider setting aside 5 – 20 minutes each day to meditate (If you’re new to meditation, I highly recommend starting with an an app like Headspace or Calm). A huge part of having a positive mindset is expecting positive results, but it’s really difficult to expect what you can’t see as a potential reality. Set aside a few minutes each day to really visualize yourself achieving a goal that you’re working towards and to get really concrete about what success looks like. How do you feel? Where are you? What are you doing? Who is with you? It’s a lot easier to aim for and be motivated by something specific that you’re emotionally connected to. It’s kind of like anti-worrying – instead of visualizing all of the things that could go WRONG, you’re visualizing what it will look like when everything goes RIGHT. There’s no room for resentment in a positive mind, and so it’s important to get to a place of forgiveness for your OWN well-being, even though you may feel that the person on the receiving end doesn’t deserve it. This also includes forgiving yourself for things that have happened in the past. However, it’s one thing to KNOW that you need to forgive, and a much more challenging task to actually DO it. I really love this interactive forgiveness exercise by YouTuber Kalyn Nicholson as a starting point. After you’ve decided to forgive and let go, you may still be tempted from time to time to dwell on the past (old habits die hard, amirite?). Speaking from my own experience, I found that I was still harboring a lot of resentment over a pretty craptacular relationship. A common pattern for me was having some sort of trigger in my environment like a song on the radio lead me into a negative spiral of rumination over things that can’t be changed and that, quite frankly, don’t matter. Follow your re-framing statement by immediately doing whatever you have to – watching a funny YouTube video, jamming out to your favorite song, call a friend, anything – to shift your thoughts away from it entirely. There’s something magical that happens when you can transform what felt like an overwhelmingly negative experience into a source of gratitude, so I highly recommend you give this a try! 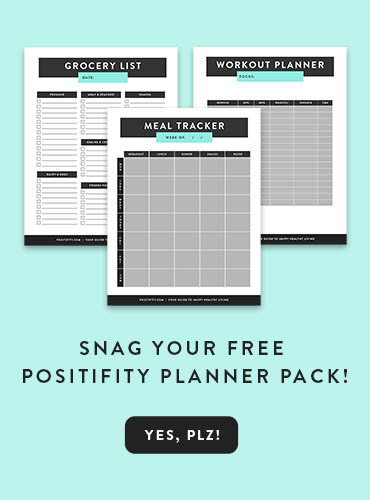 Make sure to download your checklist of action items so that you can get started on your positive mindset makeover today. You deserve it! What is the biggest challenge you face in trying to be positive? What tips do you have that I didn’t mention? Let me know in the comments below!